Back to the real iPhone for a while... Gravatar, or globally recognized avatar, is an interesting free service. It can be integrated with AddressBook app or other apps that can have a picture related to email address. Here an Objective-C Example to retrive the Gravatar. It's really simple! 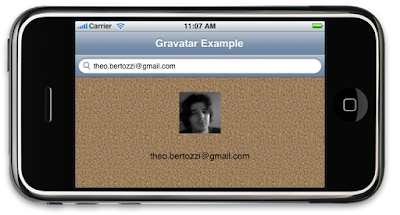 The Source Code is Available Here: iPhone Gravatar Example. The Apple Worldwide Developers Conference (WWDC) takes place June 8-12, 2009 held at Moscone Center West in San Francisco. http://developer.apple.com/WWDC/.